Parker has been making safety razors for over 40 years. Once thought as a second class safety razor manufacturing company, Parker has worked hard over the last few years to improve the quality of their products and now have their own loyal following among those who want a reasonably priced, but good quality razor. The Parker 29L “Unisex” Long Handle Double Edge Safety Razor is the ideal starting razor for both men and women who are tired of paying the high price for their cartridges or throwing away those easy to break safety razors. It has a brass frame covered in chrome plating. Comes with 5 shark blades. The 29L “Unisex” razor is designed to be used comfortably by both men and women. The handle is ideal to meet the needs of those men who want a longer handle when shaving their face, but thin enough for a woman’s smaller hands. 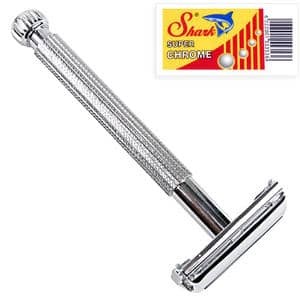 The textured handle makes this razor easy to grip even with damp or wet hands and the butterfly opening makes changing those blades easier than with some other type of razors. Reviews for this razor are exceptionally positive with the majority of users who shared reviews for this product tending to be women. Close Shave: While men like how close they can shave their beard when they use this razor, women also feel that it shaves their legs and underarms equally close leaving them feeling smoother than when using other razors. Nice Heft: Both men and women feel that it has enough heft to feel substantial in their hand and glide smoothly over the skin without applying undue pressure that results in nicks and cuts. Long Handle: Both sexes like that it has a long handle, feeling that this length makes it easier to control the razor and make it more comfortable to hold. High Enough Quality to Last for Years: Users like the fact that this razor though inexpensive is high enough quality to last at least a few years. Some users have actually stated that they purchased this razor as a starter razor, but decided to stick with it because it performed so well. Overall, the Parker 29L “Unisex” razor seems to please both men and women and is a good razor for those who want to enjoy the “old fashioned” shaving experience without breaking the bank.